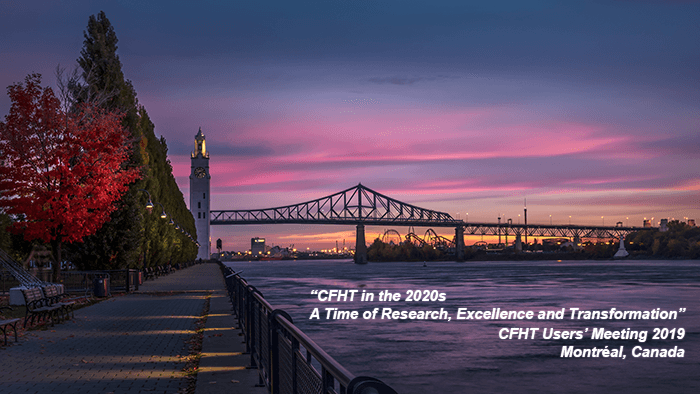 CFHT’s triennial Users’ Meetings are important opportunities for our community to share recent discoveries and perspectives that help guide CFHT’s future. The range of possible futures for CFHT has perhaps never been more diverse as we explore opportunities that will substantially define CFHT’s legacy in 21st century astronomy. Near term, CFHT’s future remains rooted in innovative operations enabling world-class surveys and PI research. Longer term, with the rapid advancement of the Maunakea Spectroscopic Explorer (MSE), CFHT is poised to make a quantum leap in its mission, becoming a truly pivotal research facility in modern astronomy. Balancing these options as we develop a strategy forward remains one of today’s challenges and will be an important topic of discussion at the Users’ Meeting. All of these possibilities are ultimately grounded in the research capabilities CFHT’s community has developed to date. These include a suite of 5 instruments that collectively enable wide field imaging and high resolution spectroscopy and spectropolarimetry at optical and infrared wavelengths, and spectro-imaging from UV to ~1 µm. Large Programs are now the focus of >50% of the observing time at CFHT and annual publication rates have never been higher, exceeding 200 papers per year. Thanks to all of these efforts, CFHT’s science impact remains among the highest of any ground based telescope in the world, year after year. Combined with its location at a premier site like Maunakea, CFHT will celebrate its 40th anniversary in 2019 in a strong position to contribute to astronomy for many years to come.